Majorca is a rural village and former gold mining borough 10 km south-east of Maryborough and 130 km north-west of Melbourne. Majorca was the last large goldfield in the Maryborough region to be discovered. In 1858 the Gibralter diggings had been found (so called because of an escarpment), and in 1863 the Majorca field was found nearby. (Possibly the name was given because of the proximity of the Mediterranean island of Majorca to Gibralter). A township grew rapidly. A court was opened in 1863, a Wesleyan congregation formed in the same year and a school was opened in 1864. (The sons of a Cornish miner, Michael Nicholas, attended the school in the 1890s and later founded the Nicholas Aspro pharmacy industry). A borough council, comprising Craigie and Majorca, was created on 28 December 1864. It was named Craigie borough until 1876 whereupon the name was changed to Majorca in recognition of the municipality’s administrative centre. 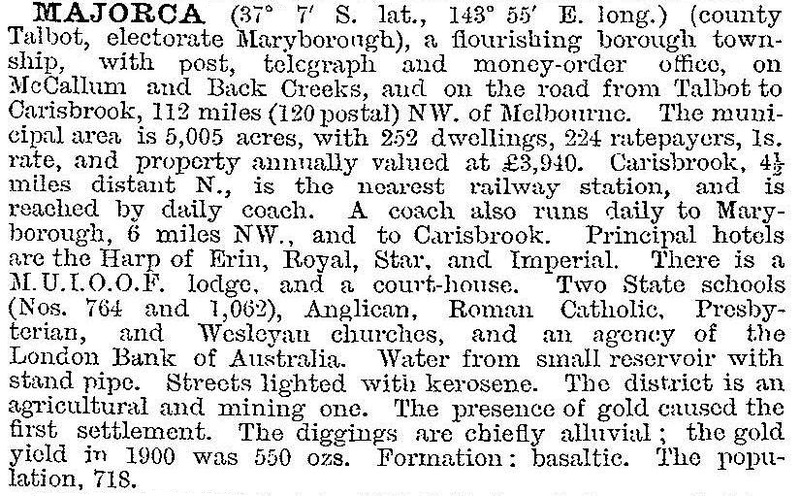 By 1872 there were also Catholic, Anglican and Presbyterian churches, a mechanics’ institute (1866), several hotels and numerous quartz and alluvial gold workings. The largest mine was the Kong Meng, which continued until the 1880s. The Catholic church closed in 1910, and the borough was united with Tullaroop shire in 1915. The last hotel closed in 1936. Between 1968 and 1975 the Presbyterian and Anglican churches and the post office closed, and the school in the following decade. Majorca was disadvantaged by being on no significant main road (although four minor roads radiate from it) and by being close to the centralising tendency of Maryborough. Chris Earl, The history of Majorca, the author, 1976?